The first thing you notice about the group exhibition People Like Us at UNSW Galleries is the sound. You enter a foyer through glass doors and immediately hear snippets of violin, the ascending tones of woodwinds and a soaring operatic soprano. Michael Nyman’s The Art of Fugue (2012) is a video work situated outside the main gallery space, and before you see the screen its arcing melodies are resonating around the high ceiling. When you arrive in front of the work, the movement of amateur male photographers and their scantily clad female subjects immediately becomes operatic as Nyman’s composition turns this recorded experience in Mexico City into a kind of choreographed performance. Like the photographers in Nyman’s piece, who mediate their way of seeing the world through the barrier of the lens, this exhibition is concerned with the interrelationship between art, technology and human experience: how technology facilitates or disrupts our connection to information and the environment. Curator Felicity Fenner gives us a diverse array of contemporary works that seek to challenge the anxiety that technology is isolating, that it is making us withdrawn and disengaged. As the exhibition title infers, what is significant here is the human, our personal relationships not only with technology but with the people around us. This tension between community and isolation, between switching on and plugging in or tuning out, thematically runs across all the works. 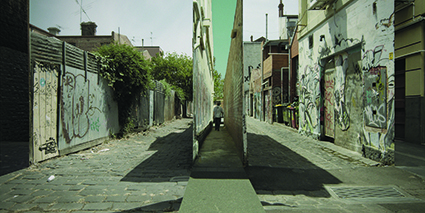 Daniel Crooks’ A Garden of Parallel Paths (2012), which splices video of Melbourne laneways into one single moment, each laneway sliding into the next, brings together the virtual and the real. There’s something eerily familiar about all of these paths and, when viewed in a constant scroll, the work becomes like a maze, claustrophobic and compact. It’s oddly jarring when figures pop up in the laneways, seemingly walking beside one another but separate all the same, as a hushed drone plays out over the top. Similarly, there’s an element of intimacy and pathos right alongside separation in Jason Wing’s Syrinx (2015) where you peek round a black curtain to find a solitary empty wooden chair and a pair of headphones and focus your attention on the shrieks of black cockatoos that tell the story of Aboriginal suffering and displacement. Wing’s work sits next to the whistlers in Angelica Mesiti’s The Calling (2013-14), a three-channel video installation showing three remote communities where this tradition is carried on. While Wing is focused on absence and deletion, Mesiti turns to communal presence. A teacher stands before a class, a common enough occurrence, but here he is communicating entirely through whistling—a call and response with the students. Mesiti takes the time to focus on a particular gesture, a raised hand, a smile and three pieces of women’s clothing on a line, swinging in the breeze. This is finding the transcendental in the everyday moment, a kind of sacredness, and yet she is also questioning how a tradition can fit inside the modern world. Will it change in the face of technological advancement? In a separate room to the right of Mesiti’s work, the body appears: we are brought back to human limbs, sinew and blood. Yuri Ancarani’s Da Vinci (2012) is not for the queasy with its robotic surgical procedure projected on an entire wall. I like this movement from the transcendental to the physical. It feels as if metaphysical transport must be brought back down to earth and seen among the corporeal. As Ancarani’s title alludes, the work references that old collision between art and science, propelled forward since Da Vinci’s own Renaissance. Seeing surgical procedure close-up brings home an awareness of layers via technology’s capacity to reveal what goes on under the skin and to rupture, cut and repair. The curator’s note accompanying People Like Us suggests an artistic preoccupation with our ‘inner selves’ and indeed Ancarani turns inside, forcing us to acknowledge the pulsating veins and vessels that make up the body. Grouping such disparate works brings with it the sense of a lack of cohesion, with some of the works sitting uneasily beside others. Su-Mei Tse’s purring cat portraits seem an odd choice right alongside Mesiti’s poetic videos, and George Poonkhin Khut’s interactive Brighthearts app, which monitors breath and heart rate, jars against Nyman’s elegiac Symphony No. 11: Hillsborough Memorial (2014). Then again discord does form a significant part of our relationship with technology and indeed with each other, particularly in our attempts to negotiate excessive amounts of information. If Felicity Fenner is attempting to question how technology impacts on our way of viewing the world, then these moments of dissonance need to be considered. Sound does provide a form of unification: there are birdcalls and the hiss of a spray can from Joan Ross’ The Claiming of Things (2012), Mesiti’s whistles and Crooks’ subtle bell tones. With a sideways glance to Nyman’s work, you can think of that sonic experience as being like a fugue, a musical composition that relies on contrapuntal motion—the movement of melodies against one another. The word ‘fugue’ stems from the Latin ‘to flee’ and ‘to chase’, and I like the idea that each sound seems to chase after another; with the whistle, the bird cry, the whirring of bicycle pedals, there’s a brief meeting of tones, one emerging as the other subsides, interlocking the works. And when thinking of the exhibition as a whole, and trying to reconcile moments of disparity, the placement of the works can also be likened to the harmonies of a fugue. Because what People Like Us is offering is a similar kind of experience: it is simultaneously an interchange of different ideas, interweaving at some points and crossing over, before falling away.